A. a. antigone from India with the distinct white "collar"
↑ "Antigone antigone". IUCN Red List of Threatened Species. Version 2013.2. International Union for Conservation of Nature. 2012. पहुँचतिथी 26 November 2013. ↑ Blanford, W.T (1896). 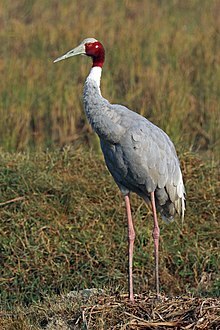 "A note on the two sarus cranes of the Indian region". Ibis. 2: 135–136. doi:10.1111/j.1474-919X.1896.tb06980.x.